Jerome, Arizona, is one of the oddest, most colorful towns in the state. Its history is rich, and its public history is thriving. Now a major tourist destination, as well as a small artists’ community, one can see Arizona history, and indeed U.S. history, in every corner. At a wine tasting one can see a passing motorcycle gang maneuver up the narrow streets, while a ghost tour marches downhill toward one of Jerome’s many historic sties. Jerome is itself a museum, an exercise in public history, but it is caught along the fault lines that make public history a contentious endeavor. Ruins of a primary school. Many go to Jerome to see the Old West as John Wayne, Clint Eastwood, John Ford, and others portrayed it. By the time How the West Was Won debuted in 1963, the Jerome Historical Society, founded a decade earlier, was already busying itself purchasing saloons, churches, mining equipment, and other property to advertize Jerome as a ghost town. Today, the Jerome Historical Society tends to dominate public history, and their goal from the beginning was to draw a crowd. Popularizing the town’s title, ghosts are now a prevalent motif. One can go on a ghost tour, visit a haunted hotel, then eat lunch at a ghost-themed restaurant. The Wild West narrative appears in the ruins of Jerome’s schools, jails, brothels, and saloons, and a past rife with outlaws, sheriffs, and western debauchery in a lawless city where anybody can make it big with the swing of a pickaxe. Entrance to an abandoned brothel, The Cuban Queen. 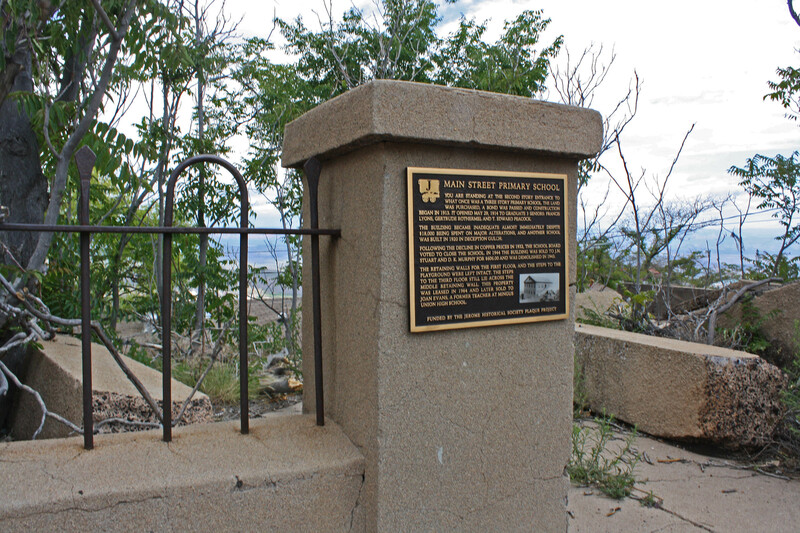 Jerome is haunted by this history, but by other histories as well. History is contentious, often snagged between fragmented political agendas. Today, several state legislatures want to change AP U.S. History curriculum to emphasize American Exceptionalism, a word that makes most historians cringe. Jerome may not be as fraught with politics, but the ghosts that haunt it are more than the usual characters in a typical western. There is Charley Hong, who emigrated from China in 1880, two years before the U.S. passed the Chinese Exclusion Act. He became a wealthy businessman, owner of the popular Bon Ton Restaurant (later the English Kitchen). Though a local celebrity in Jerome, the xenophobic climate in the west persisted, to the point that his restaurant was bombed in 1909. Miners haunt the town as well. Making it rich by mining may sound appealing, but the work was arduous, usually deadly, and compensation was minimal. To make matters worse, in 1917 corporate managers rounded up miners suspected of affiliating with workers’ rights organizations like the Industrial Workers of the World (IWW), forced them onto cattle trains, and deported them out of town. Meanwhile, the local hospital witnessed approximately 9,000 deaths. It is impossible to fully capture the diversity of Jerome’s history, and here I fail to do it justice. Public history, however, is an important venue for historical inquiry. The ghosts that haunt Jerome are more than just a handful of quirky characters. Jerome is haunted by the miners, the migrants, the unnamed lawbreakers, the women who worked in the town under challenging and dangerous conditions, the indigenous communities in the area. Jerome is indeed haunted, but most of its ghosts remain unheard. I intend to conduct more research, because for me history is about listening past the vast silence of time to let the old voices speak, and Jerome is shaking with eager voices. This entry was posted in History, Travel, Writing and tagged Arizona, AZ, ghost town, ghosts, History, immigration, Jerome, mining town, southwest, tourism, Travel, Wild West, workers on May 29, 2015 by keeneshort.